Warchal makes a synthetic composite core type of string that tend to require less tension to achieve concert pitch. If you have a viola that at times tends to feel 'tight' or hard to respond, the Brilliant or Karneol strings will lean more towards that way. 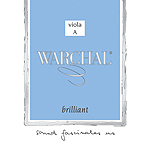 Because of their composition and material used, Warchal warns players that it can take 2-3 days until the strings are fully stretched and playing their optimum. The new Brilliant Viola Strings are with a special alloy of aluminum and in the same neighborhood as the Evah Pirazzi type string. Very responsive strings. 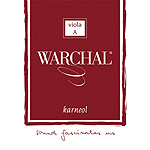 Karneol viola strings require less tension with similar composite core technology. Less tension often allows for more responsiveness in the viola.